Recycled Elastomers Market size will surpass USD 6 billion by 2025; according to a new research report by Global Market Insights, Inc.
Growth in the home and gardening industry of North America, owing to the improved living standards, resulted in an increase in investments by consumers for their gardens as extension for their homes. In 2017 alone, the market for home and garden in the U.S. reached about USD 272 billion and this is expected to grow by another USD 10 billion by the end of 2018. This will be one of the major propelling factors that will impact the recycled elastomers market growth in a positive manner. Recycled elastomers, mainly made from end of life tires, are used in flooring tiles and sheets for gardens, bathrooms, kitchens, laundry rooms, etc. The product is widely used as a substitute for traditional wood bark for landscaping and garden surfacing applications, due to its superior properties as it does not decompose, dry, blow away, retains heat, color shapes and acts as a suppressant for bugs and weeds. The above-mentioned trend is anticipated to follow and will give an up thrust to the recycled elastomers market in future. Growth in the sports industry will result as the major contributing factor for the growth of global recycled elastomers market in coming years. Reclaimed rubbers are used in playground surfaces as well as in sports grounds. Crumb rubber which is derived from end of life tires are mostly used as the infill materials for synthetic turf fields. The product is spread between the grass fibers to provide cushioning and traction to the players while they are playing. Increasing commercialization of sports events will encourage the people across the globe to play professional sports, and thus will boost the building of new playgrounds as well as repairing old ones for training and playing purposes. This will boost the recycled rubber market growth in the forecast timeframe. Based on revenue, the recycled styrene butadiene rubber will observe a CAGR over 13% over the forecast spell. Product properties such as shock & sound absorption, non-slipperiness, light weight, permeability, insulation, and abrasion & crack resistance makes them acceptable by various industries and makes them superior over the traditional materials. 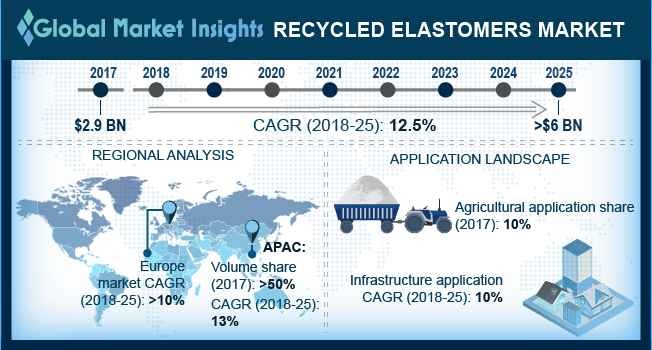 Infrastructure industry shows a substantial growth among the application segment of the recycled elastomers market with annual growth rate of around 10% over the forecast time. Surge in investment in construction projects by government and private sectors across the world will significantly boost the product demand in future. On the basis of volume, Asia Pacific recycled elastomers market will witness the CAGR close to 13%. Population growth and rise in disposable income of the individuals in the region will substantially augment the medical, agriculture, sports product, infrastructure, home & garden industry in Asia Pacific, thus prompting the recycled rubber demand positively in Asia Pacific. Some of the prominent players in the recycled elastomers market include GRP Ltd., Liberty Tire Recycling, American Tire Recycling, West Coast Rubber Recycling, Monmouth Rubber & Plastics Corp., J.Allcock & Sons Limited, RubberFoam Recycled Products LLC, American Recycling Center, Green Rubber One Sdn. Bsd., Austin Rubber Company LLC, Klean Industries, Genan Holding A/S, Rubbergreen, Entech Inc., Emanuel Tire Co and others.